Inline skating lessons with an instructor aren’t cheap, and although I believe you get what you pay for, I’ve written this page in the hopes of helping you to get more out of your lessons. Of course I’m a little biased being an instructor myself. It’s really important to practice between lessons if you want to get the most out of your money. Practice will help you improve on the drills and skills worked on in the previous lesson and will help settle your skating muscle memory of those movements. You’ll also spend more time on your skates which equates to more time spent working on your balance. Thus, when you start the next lesson, you’ll be at maximum sponge-like absorbency ready for all the cool new skills we’ll cover. Muscle memory refers to the body’s ability to memorize, or perform automatically, a well rehearsed motion. Here’s a great article by Erika Kennington on muscle memory and skating. Of course you can still take the lesson even if you didn’t get a chance to practice. You’ll still learn new skills and have a good time. This can be a good option if you’re perhaps not so confident and in the early stages of learning to skate. It’s very common to feel wobbly all over again when you put your skates on for another session. What happened? It’s not your fault – it’s just because you haven’t been skating long and thus your muscle memory as related to skating isn’t so deeply laid down just yet. Relax, and in about 10-15 minutes you’ll feel much more balanced and co-ordinated as your body remembers what happened the last time you went skating. You could get this feeling for between a few weeks to a few months, depending on how much skating you do and how often, so just be prepared for it and warm up slowly and with caution. This is one of the best reasons to arrive early before your lesson, and take the time to warm up. The wobbly period isn’t the best time for learning new skills, so it’s nice to get it over with during the warm-up before your lesson. Of course, if you’ve never worn skates before and/or this is your first lesson, then don’t do this as we’ll cover some essential safety and falling tips on the grass first. They’ll make standing in your skates on the tarmac much less scary. Definitely try to avoid a lack of sleep or a hang-over before a lesson as those are not conducive to learning. Skating is great exercise, and best of all it doesn’t feel like exercise since it’s so much fun. Work on the drills that you find harder – you’ll get more benefit out of these than from the easier drills because they’ll challenge you more. Always do more work on the weaker side. Many drills, such as the scooter, need to be done on either side, and nearly everyone has some degree of asymmetry. Working on the stronger side might feel more rewarding, but it’s much more important to bring the weaker side close up to your ability on the strong side. You’ll become a much better skater as a result of doing this. Discipline yourself to do 10-15 minutes of drills every time you go out skating on your own, but perhaps not much more than this as you want to keep the enjoyment factor up. Then go and skate and have fun! Build hours on your skates – the more time you spend on your skates the quicker you’ll learn. In the early stages just skating lots will bring huge improvements to your balance and co-ordination. Later on you’ll need to work on technique more and more to gain useful improvements. Always look up. Looking down at your skates not only gives you poor balance, but it doesn’t help to develop your sense of proprioception, or your unconscious sense of where and how your body is positioned in space. That’s an incredibly useful skill in skating because it will help you to correct yourself when an instructor isn’t around, and to translate someone else’s body position in a particular move to your own body. It’s a good way to become less dependent on an instructor. Bend your knees. No, more than that, still more, and a bit more… You get the picture! You always want to have a sense of bum down, head up, which leads to better balance and easier moves. I won’t teach when surfaces are very wet because there’s significantly reduced traction. That’s not a good thing when I’ll be pushing your abilities during a lesson! That’s not to say I won’t skate in the rain, but I’m much more careful when I do. Because I’ve been skating for some time, it’s easier for me to make my movements smooth and careful, and that’s what’s needed to avoid falling in slippery conditions. A bit of dampness is fine. Click on the FAQs page and then lessons – this has a weather page with links to forecasts, rain radars, and webcams that I use to check whether the roads are dry before heading up to Hyde Park. Have fun on your skates! Go on a social skate with friends. Join a fitness or speed club if you want to get fit. Use your skates to run errands. Don’t be afraid to ask questions if you don’t understand something you’ve been told. One of the marks of a good instructor is his/her ability to convey a concept in different ways, i.e. in the way that gets you to understand what the instructor is looking for. Everyone is different and may not understand a particular explanation or drill. If you’ve taken a lesson with me already, and can’t quite remember all the drills, send me an email and I’ll send you a list of the drills we worked on with the key points that are important for each. When do I stop learning? It never stops – even skaters who’ve been skating for 10 or 20 years spend extensive time on their technique and skills. For me that’s the beauty and joy of skating – the challenge never ends and there’s always something new to learn or to improve. That’s not to say you need or want an instructor over this time, but more about how important regular practice is over a long period of time. 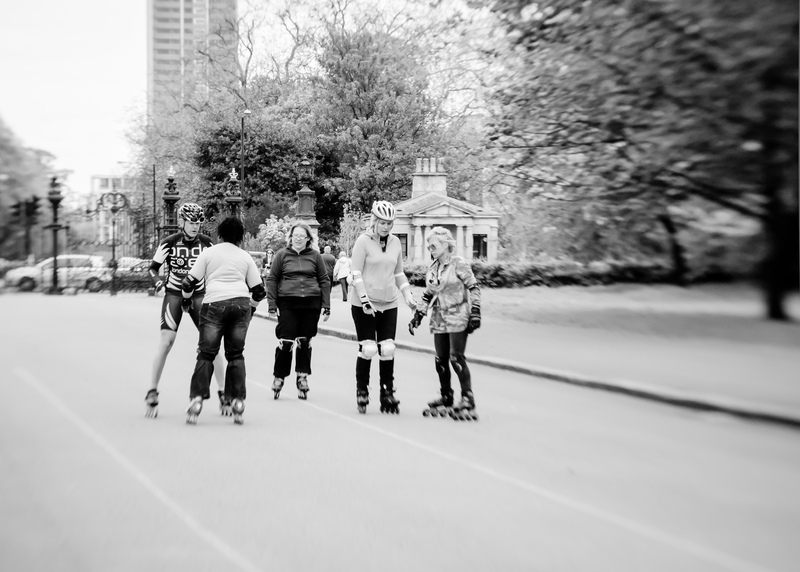 You’d be amazed at how many of the incredibly cool and skilled skaters such as those found in Hyde Park were rank beginners only a few years ago. Different people interact in different ways, and that results in not all people liking or enjoying the same instructor. There’s nothing wrong with trying different instructors to see who works best for you. And, like with all teaching, some are better instructors than others.